Trouble in the kitchen... and this time it's not from the dogs... My sister is the person in charge of doing spiced nuts at Thanksgiving, but I hate to wait for the holidays. 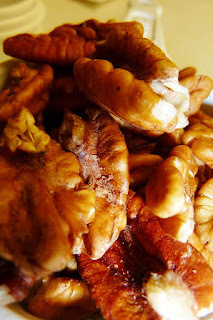 I like these nuts on salads and in breads... They're not just for Turkey Day any more! So, I thought I'd take matters into my own hands. That's where the problem began...And the trouble isn't coming from my sister, either... It's coming from the original recipe I made. I didn't use hers. I concocted my own. So, what happened? Not enough orange juice in my first batch. I'm pretty certain that insufficient use of OJ in recipes is cause for a criminal action here in the State of Florida, or it should be. Okay, so what did I learn from this experience? Don't try to replicate your sister's recipe... No, no, that wasn't it. Don't try to improvise? Hopeless. That's what I do best in the kitchen. Well, I think I do best, although this may not be a stellar example. 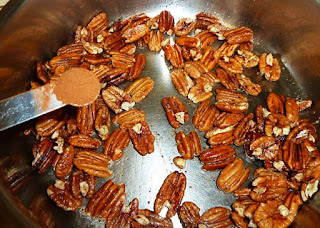 What I learned is that when making spiced nuts, you need enough liquid to coat them with the spices. And not just a tablespoon or two for a couple of cups of nuts. Nooooooo... That's not right no matter who tells you. Some real liquid is needed. Liquid that can reduce and cover the nuts. Sounds basic right? Well, I must have been nuts when I didn't see it coming. My sister's original recipe calls for quite a bit of liquid, and she slow cooks hers in the oven. I'm trying to do this in less time. So, with recipe tweaked... I am now ready to begin! 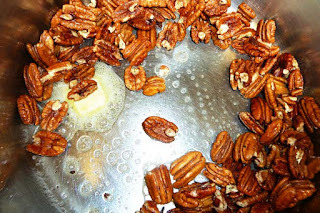 Ask me to name my favorite nut and certain people will immediately come to mind, but leaving them aside, I would have to say.... and this is a hard one... pecans. I love their soft mellow taste. Alone, as an ingredient, or on food, they are a treat. Naked or spicy, they are enticing. One of my favorite pecan treats, apart from pralines, is spiced pecans. There are so many recipes for this, that one can get dizzy from choosing among them. 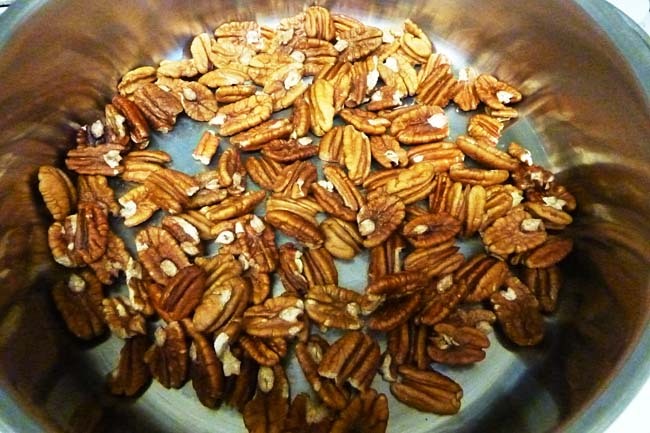 For me, I like my spicy pecans with a hint of orange...Coming from Florida, I suppose that could be expected. But it's all in the combination of spices... cinnamon, clove, nutmeg... with a dash of orange grate and more than a splash of orange juice. Then, the chipolte pepper for a bit of heat and smoke. Ahh... Delicious! The biggest problem is that this also happens to be one of my pooches' favorite goodies. So, things can get nasty around the nut bowl. You too may find yourself jostling for position around the spiced pecans, so you may want to double up on the recipe if you have a nutty crowd. 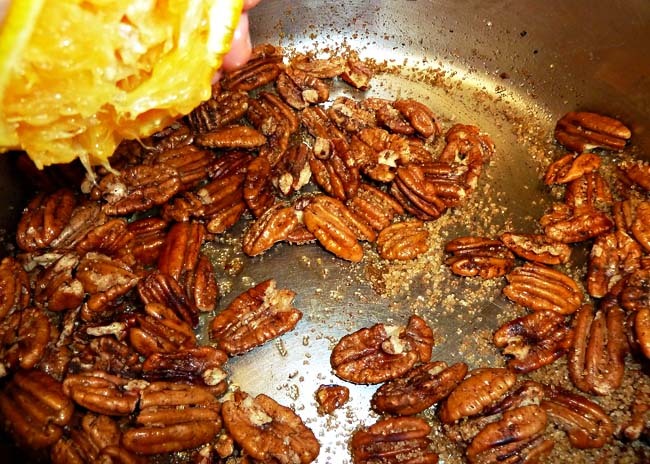 These spiced pecans are easy to make and call for just a little hard work when it comes to grating the orange rind. You can substitute grated orange rind for dried orange peel, which you will find at the grocery store in the spice section. Although dried orange peel is strong, nothing beats the vibrant flavor of the freshly grated orange rind for this recipe. 1/8 Tsp cayenne or ground chipolte chili pepper. If you can find the smokey chipolte ground pepper, that gives it a wonderful kick. 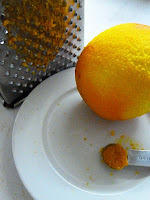 1/4 Tsp freshly grated orange rind of a sweet orange or dried orange peel. If you don't want a strong orange flavor, you can cut this back to about 1/8 of a Tsp. To punch up the flavor a bit more, you can also add a tablespoon of Grand Marnier, but that is optional. The liqueur gives it an exquisite flavor. 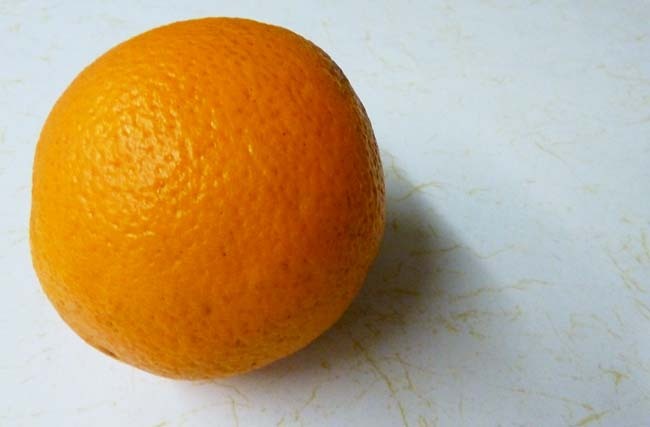 Grate the rind of a sweet orange, such as a Valencia, Hamlin, or Naval orange, careful to grate only the orange part and not the pith (the bitter white part beneath the orange skin.) You will find that with oranges that are better suited to juicing, such as the Hamlin or Valencia, the skin is rather thin, so be extra careful when grating the skin of those oranges. The Naval orange has a lot thicker skin and is not quite as sweet generally as the other two, but it can still be used in this recipe and it works very well. Set the grated rind aside. Squeeze out one enough juice from the orange for 1/2 a cup and set that aside. 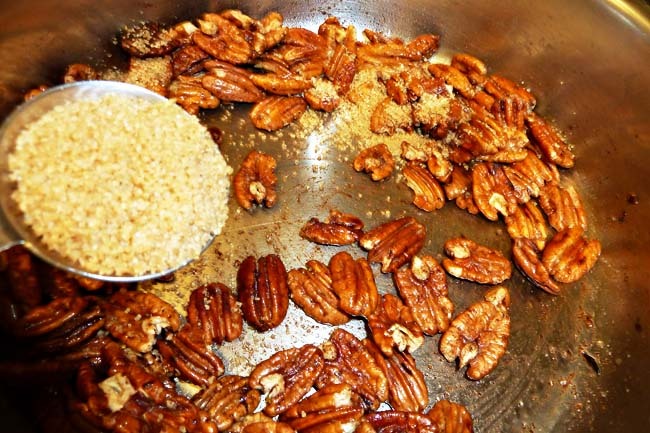 If you feel you need more liquid to coat the nuts later, you can add a bit more orange juice or water. Place the pecans in a heavy skillet on medium heat and toast until brown for about four minutes. You want to stir them frequently so that they don't burn or toast on just one side. So keep an eye on them. Add the spices, including the grated orange rind. Add the brown sugar. For easier coating, you may want to grind your sugar in the blender or food processor first. 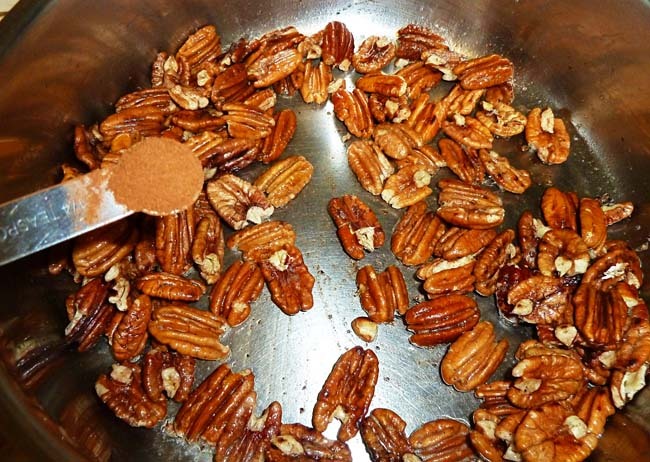 This makes the sugar lighter and it will coat your pecans more easily. Add the orange juice. Stir and continue to cook until the mixture begins to reduce and thicken. In this photo, you see that more orange juice or water is necessary to help dissolve all the spices and coat the pecans as the sauce cooks and reduces. Adding more liquid also reduces the chance of the pecans burning. To give it time to cook and allow the mixture to thicken, reduce the heat to low. Keep a constant eye on the mixture as this tends to go pretty quickly, especially if you're light on liquid. 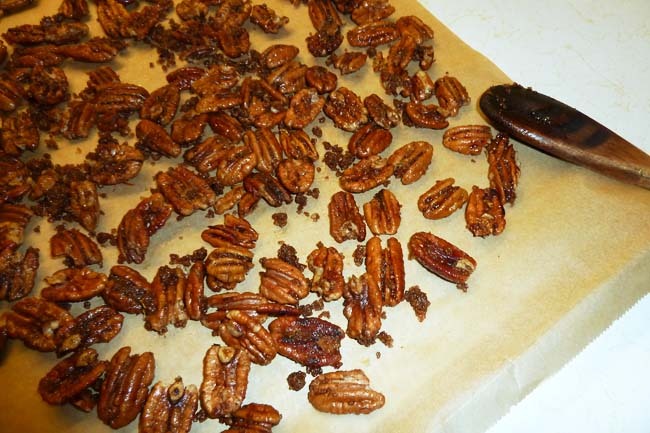 Move the pecans to a board covered with parchment paper and spread out the nuts. Very nice! I can almost smell their aroma of toasted goodness. Oh, YUMMY! I love roasted, spiced nuts and this recipe looks wonderful. Thanks so much for sharing! very superb i like post.